Alium is a smashing WordPress theme, part from the collection of fully blue platforms for outstanding blogs and sites. The first impression of this theme is surreal. The dark shades of blue that fill Alium create a sense of mystery and a different reality. 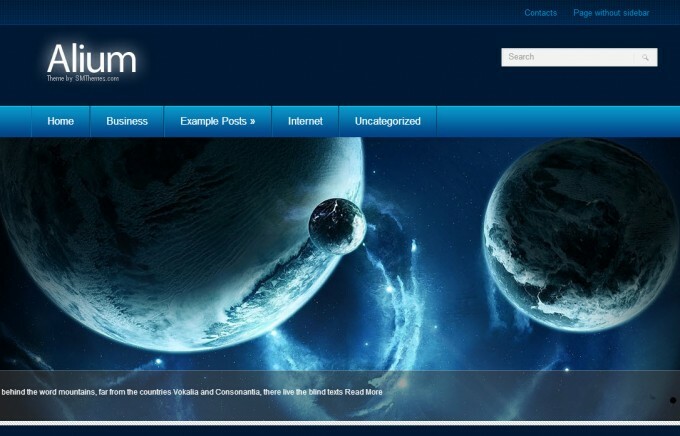 The theme resembles the cosmic ambience and attracts visitors to stay longer on the page. What more can you have for your blog? Clean and stylish, extraordinary and natural, Alium is designed to be simple and at the same time effective for truly delightful browsing experience. The two columns layout puts everything at the right place. On the top of the page are disposed the horizontal menus for an easy access to the different sections. A fabulous slideshow introduces visitors to the site. In the middle of the blog are the posts that bring many possibilities for formatting and editing of content, videos and images that complete the site. The theme is appropriate for versatile purposes, including personal blogs where you can arrange your own space on the web just the way you like it. It is a great choice for business sites as well. It is easy to organize the content in different categories and put the highlight on the featured videos, images and posts. Once you complete your blog, don’t just keep it for yourself – share it with the audience via the social networks. Have no doubts that your site will look marvelous everywhere in the world, from every device that is used for browsing through it. Alium is a responsive theme after all!